Pure pretty! 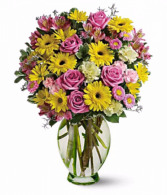 This classic floral design puts a sweet spin on your good wishes in brilliant shades of pink and yellow - all presented in a gorgeous glass vase. Va-va-bloom! 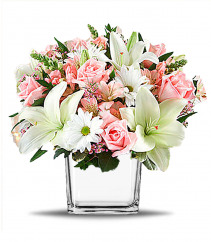 This grand array of purple hydrangea, light pink spray roses and white asiatic lilies is presented in our cube. 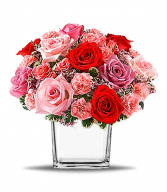 Surprise her with a beautiful bunch of love - a cute, compact bouquet of flowers in a silver glass cube. She'll be dazzled by this classic, yet contemporary gift - and impressed by your impeccable taste. Your loved one not feeling too well? 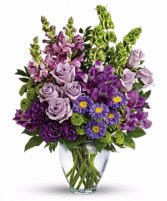 Perk up your their joyful spirits with fresh flowers that are bound to give them a boost in this thing called Life. Flowers not the optimal choice to send? 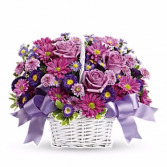 Have gift basket of sweets and popcorn delivered to their home, nursing home, or hospital. They say the best things in life are free? Little do we know the best things are free and delivered to your door. 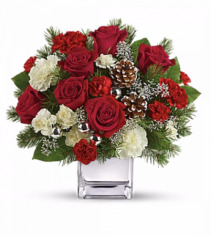 If you can’t deliver the gift yourself, Inland Bouquet Florist in San Bernardino, CA will be the flower shop that delivers hand-made arrangements and gift baskets for you. We use the freshest flowers when making your floral arrangement. If you’d like you may also pick-up the arrangement. These get well soon gifts are the perfect way to send your positive, happy thoughts and best wishes for a speedy recovery. Sadness, Depression, and a sense of loneliness are common with someone battling mental or physical health issues. Far too often do people feel unnoticed during the daily transactions of life. Send them fresh flowers or a gift basket to show them you love them, even if they insist they are fine. If your recipient is recuperating in a rehab facility or is currently in a nursing home, a bright and cheerful bouquet lift their spirits in a grandeur way. Consider a long-lasting potted dish garden that will cheer up their room while also purifying the air. 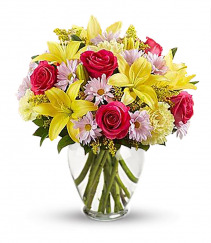 Colorful flowers decorate their day with love and warmth. Many times a designer’s choice arrangement can go a long way in helping you show love and appreciation for your recipient. It's a lovely thing to do, and they're sure to be back on their feet soon. 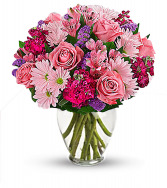 If your friend is recovering from an accident, surgery or a serious illness and is in the hospital, be sure to read our tips for sending get well flowers to a hospital as many ICUs will not accept floral bouquets. 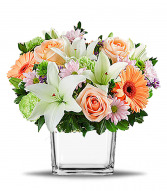 Sending flowers is a thoughtful, simple way to demonstrate how much you care, and we have arrangements suitable for him or her. 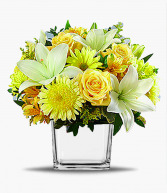 Whether it's a family member, colleague, or best friend needing cheer to get through their day, you'll find the perfect bouquet to put a smile on their face. 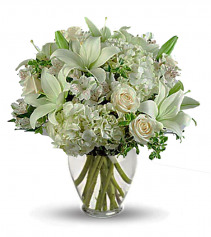 At the end of the day Let INLAND BOUQUET FLORIST of San Bernardino, CA help you send get well wishes to your friend or loved one. 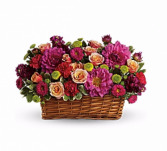 Don’t forget to show them how much you care with a get well gift basket filled with a floral arrangement or customized get well gifts. A basket filled with snacks, bath products, unique jewelry and accessories, or a favorite stuffed animal is a great and easy way to cheer up a loved one. Top off your personalized gift with a fun balloon bouquet. Wanting something a little more traditional? There is no better or simpler way to remind someone that you're thinking of them than with get well flowers from INLAND BOUQUET FLORIST. Scroll down to browse and order online from our sample selection of get well flowers and plants or call to customize a gift for that special someone. Let INLAND BOUQUET FLORIST of San Bernardino, CA help you wish a loved one a "Get well soon".